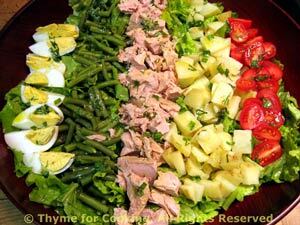 Salade Niçoise, quick, easy gourmet recipes. I think canned tuna is no longer considered suitable food for the gourmet in the U.S. That's not true in most of Europe. Canned tuna is still very popular and the types, brands and range of prices is amazing. A proper 'Salade Niçoise' would never be served with anything but canned tuna - a premium canned tuna, yes, but never fresh tuna (and in my opinion, fresh tuna is much to dry for a good 'salade'). Cut potatoes for salad and put in steamer basket in large pan with an inch of water in the bottom. Cover the pan and put on medium-high heat. We're giving the potatoes a bit of a head start. Turn heat to medium and steam 10 - 15 minutes or until just barely done. Use the old, reliable 'taste test'. Remove from heat and let cool a bit. Snip tarragon and chives and add to vinaigrette, whisking to combine. Tear lettuce if needed, put it into a large, flattish salad bowl and toss with half of the vinaigrette. Arrange the beans, potatoes, tomatoes, tuna and egg on lettuce, either in rows or in pie-shape sections. Drizzle with a little vinaigrette. Serve with remaining vinaigrette on the side.